French fries can be fickle. Sometimes they’re not worth the calories at all- lukewarm, soggy, saltless, and tasteless hunks of potato that make you wish that you had chosen a salad side with your burger instead. On other occasions, though, they are impossible to stop eating, with their crispy exterior, perfect level of seasoning, and fluffy interior. However, the problem with French fries is that they are just very high in fat. The way to get around that, though, is to bake them at home yourself with much less oil. 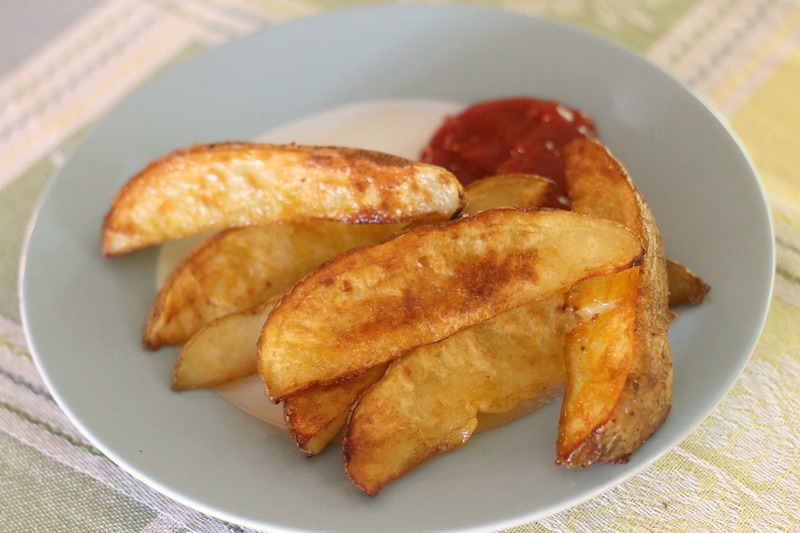 We have tried two baked potato wedge recipes: the first is a deliciously crispy but not much healthier recipe from Cook’s Illustrated, and the second is a nicely flavored, low fat fry that lacks crispiness from Betty Crocker. The recipe that we are sharing today is a combination of those recipes. We used the delicious seasoning from Betty Crocker, added olive oil, reduced the amount of oil from the Cook’s Illustrated recipe, and soaked the potato wedges before baking to help them crisp up (soaking removes starch from the surface, which will help them crisp better). As long as you bake them until they are nicely golden brown, these are truly delicious fries. The seasoning adds a nice kick, but they still taste like fries. Once you try this recipe, you will never want to try any other type of homemade fry! P.S. Happy 13th birthday Luke (our younger brother)! I know that KFC (yuck) fries are your favorite , but you should really try these! Slice the potatoes into wedges. We cut smaller ones into 8 and larger ones into 16. Place them into a pot and cover with hot tap water. Let sit for 15-20 minutes. Meanwhile, combine 2 tablespoons of olive oil, salt, sugar, paprika, ground mustard, and garlic powder in a large bowl. Once the potatoes are done soaking, drain them and then dry thoroughly (thoroughly!) with paper towels. Transfer the potatoes to the bowl with the seasoning mixture and toss to evenly coat them. Line a large rimmed baking sheet with foil and then coat with the remaining 2 tablespoons of oil. Place the potato wedges onto the pan, making sure none are overlapping. Bake for about 30-35 minutes, flipping halfway through, or until golden brown and crispy. Enjoy! What temp did you bake these at? I keep double-checking, but I don’t see one! 🙂 Thanks! Thanks for letting us know! They bake at 400 degrees F. Hope you like them! 450, sorry! Typo. The correct temperature is in the directions.